If you want your pre-teen and teen kids to listen to you (at least temporarily) beat out Pharrell and Jimmy Fallon on an Internet list. That happened to me – and you’re damn right I dad-milked that sucker – when it was announced last week that (among digital marketers) I am the most retweeted and most mentioned person on Twitter (PDF). In the latter rankings, I bested Mr. Fallon, Mr. Happy, and some guy named Barack Obama. The same study concluded that this blog – the blog you are reading right now – is in the top 25 most shared information sources among digital marketers, alongside enormous websites like Mashable, TechCrunch, The Next Web, ClickZ, AdAge, etc. Wow! 2. Lots of great people that I consider to be colleagues and friends were on the list(s) too, and sites I adore like Social Media Examiner, MarketingProfs, Buffer, Social Media Today, and Hubspot made the top 25 sources group as well. 3. These lists would be a lot different if they were focused on G+, Linkedin, Youtube, Pinterest, or Instagram. 4. 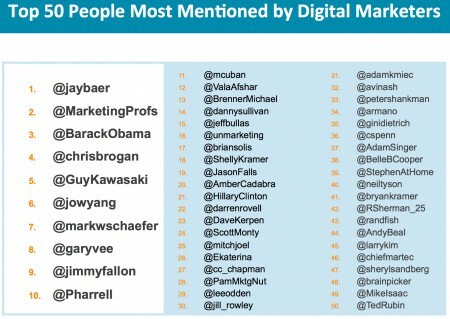 How is Pharrell the #10 most mentioned person on Twitter among digital marketers? That guy is EVERYWHERE! I’ve been on some lists in my day, but I never talk about them much here. I’m not a big believer in using a blog dedicated to marketing education to take a victory lap on your attention nickel. But after I pondered it for a few minutes, gave a speech to the Marketing Association for Credit Unions in Montreal (thanks for having me), endured a flight delay and finally boarded the tiny aircraft where I am writing this post in TextEdit (no Wi-Fi), I decided to embrace this development because it gives me a chance to remember some things. Some of this may be slightly out of sequence, but I’m old and on a plane. I remember selling my digital agency in 2005 and planning to teach at a university when my earn out concluded in 2008. I remember the simultaneous real estate and stock market collapses in 2008 putting that plan on indefinite hold, resulting in me starting a new consulting firm. I remember that this consulting firm (which was a “firm” in name only, since it was just me in my house) originally being devoted to conversion rate optimization, hence the name “Convince & Convert” – which was partially chosen because the domain name was available. I remember hiring my good friend Chris Bohnsack to create a series of logo options, and over beers at a craft brewery outside of Tucson, settling on the very distinctive one you see here. I remember deciding that the website for this new firm would include a blog, which perplexed me since I’d only written about 3 blog posts in my life. I remember waking up early and reading dozens of great blogs and online newsletters and trying to figure out the news of the day in social and digital, and then writing a “here’s what I think” post as fast as I could, and then going back to all of those sources and writing strong comments with links to my posts attached. I remember the biggest traffic day on this blog over the first three months being 242 visitors. I remember Jason Falls, who I’d never spoken to and didn’t know at all, tweeting one of my blog posts. It was the very first sign that maybe I was doing something worthwhile. I’d been blogging for several months at this point, writing four posts per week. I remember Bailey Gardiner (now called I.D.E.A) , an agency in San Diego, becoming my very first client (and we still work with a ton of agencies every day). I remember being on vacation in Los Angeles with my wife when Chris Brogan tweeted a post of mine for the first time. I actually cried, and printed out the tweet. The post was about Janelle Monae and used her as a metaphor for customer experience (if you’d like to cringe at how much I sucked then, click away). I remember shortly thereafter when Ann Handley (whom I’d never met) agreed to let me speak at MarketingProfs Digital Marketing Mixer in Scottsdale due to the urgings of my friend Stephanie Miller, who curated the email track. In those days, I still mostly wrote about email, as that was one of our major points of focus in my previous agency. I remember writing a “Guide to Enjoying the MarketingPros Digital Marketing Mixer” based on my insider’s knowledge of the area (the conference was not far from where I was living at the time) and being overjoyed when Ann shared it with all conference attendees ahead of time, giving me a dose of name recognition. I remember enjoying the email part of the event, but being enthralled by the people and the topics in the social media portion. I remember meeting Chris Brogan for the first time. Mythical. And CC Chapman. And of course, Ann. I remember meeting Amber Naslund for the first time, and can picture so clearly in my head her and Chris sitting alone on a couch by the elevators late at night, and thinking “those are people with whom I want to spend time”. I remember meeting Gary Vaynerchuk, who was just hitting his stride with his video wine blog (which taught me a ton about wine), and playing poker in the casino next to the conference with Gary and my pal Jeff Rohrs from ExactTarget (a long-time friend and now the co-host of Social Pros). I remember my idea to start interviewing people live on Twitter, which had never been done before, Joseph Jaffe being the first guest in the long-running Twitter20 series of live twitter chats and blog posts, which helped put me on the map among social media thought leaders. I remember – vividly – hiring Jess Ostroff to be my virtual assistant based on a tweet for help. Jess had been my intern for a summer when we both lived in Phoenix. She’s been with me ever since, is the managing editor of a blog that is a top 25 information source for our target audience. Congratulations Jess! I remember going to SXSW for the first time the next spring and hanging out with Mack Collier, and meeting Jason Falls in person, and seeing Patrick O’Keefe talk about his book, and meeting Shawn Morton and David Armano and Richard Binhammer and so many other people who are truly brilliant and kind and caring and supportive. 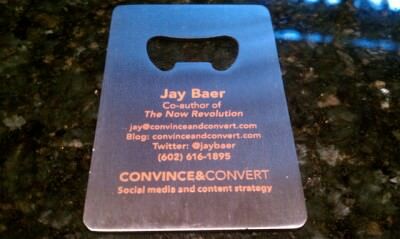 I remember debuting my bottle opener business cards at that event – a trademark to this day. I remember being a Mixologist at a MarketingProfs B2B event with Stephanie Miller and Beth Harte and Michael Brito, and that opportunity starting to position me as something other than an attendee and occasional speaker. I remember Scott Stratten recommending to Shannon Vargo at Wiley that I would be a good person to publish a book. I remember being 100% positive that I wanted to write a book with only one other person in the world, Amber Naslund. I remember being introduced to Tom Webster through Amber, who interviewed him for the book. This sparked a friendship that gives me great joy on a regular basis. I remember Jason Amunwa (formerly of Bailey Gardiner) building a great website for The NOW Revolution for us. I remember hitting the road and doing 25 or so speaking gigs about TNR in exchange for bulk book buys, the first time I’d ever done speaking in any real concentration. I remember thinking: I really like being a consultant, but you certainly get more applause as a speaker. I remember doing a 10-minute version of the TNR presentation to a packed house at the ExactTarget Connections conference, and the reaction being extraordinary. 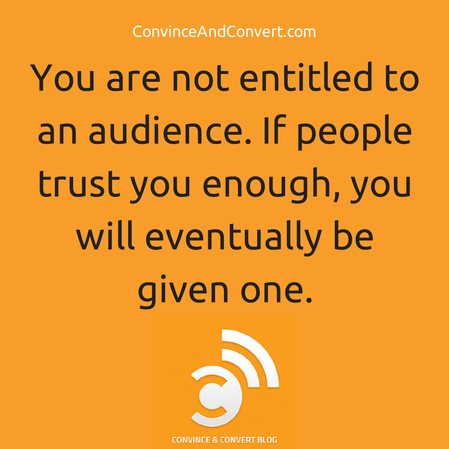 I remember Mike Stelzner asking me to guest post for Social Media Examiner, and supporting me time after time with slots on his virtual summits, and keynote gigs in both of his extraordinary Social Media Marketing World events. I remember bringing to the C&C team my former client Daniel Lemin, an ex-Googler who is a senior strategist here and is a brilliant and amazing guy. I remember moving from Arizona to Indiana (here’s why), and driving across country with two kids, a dog, a cat, a snake, a lizard, and 12 cases of wine. I remember my friends and family thinking we were crazy. I remember standing in the shower when the word “youtility” popped into my head. I remember Jason Keath inviting me to speak at many of his highly-curated Social Fresh events, and now I am a co-host and a big believer in his vision of intimate, thoughtful marketing conferences. I remember changing my name from Jason to Jay because there were already so many Jasons in social media, and my Twitter handle was @JayBaer. It took 18 months to fully make the shift, and now when people from my Arizona days call me Jason, it sounds weird. I remember working with Jess on a new editorial calendar for the blog, where I would write only one or so posts per week, with a rotating cast of guest writers, in an effort to turn this from a blog to more of a digital marketing magazine. I remember a year later realizing – somewhat sheepishly – that the less I write, the more traffic we get. I remember Eric Boggs from Argyle Social asking if I’d ever thought about doing a podcast, and us starting Social Pros together, basically on a lark. I remember reaction to my first-ever Youtility full-length presentation (at BlogIndiana, now called MixWest) being so strong that I decided it could be a book, and getting back on track with a new book project. I remember my dear friend Lisa Loeffler coming to the C&C team to handle publicity and events and special projects. She is indispensible. I remember Julien Smith helping me figure out how to take Youtility to the next level, and connecting me with my agent Jim Levine, who got me a swell book deal from Portfolio. I remember my old friend Kim Corak joining the C&C team to head up special projects, which at the time consisted mostly of helping with Youtility research and eventually, book promotion. Kim is remarkable, and now heads our biz dev efforts. I remember my pal Zena Weist (long-time Social Pros co-host) recommending ex-Edelman Digital smartie Megan Gilbert as a possible addition to the C&C team. Thank goodness. Megan is incredible and we (and our clients) are so lucky to have her skills and attitude around us. I remember so many professional speakers like David Newman, Sally Hogshead, Rory Vaden and Mark Sanborn mentoring me and showing me the ins and outs of the business side of speaking. They continue helping me day after day, and put up with my constant questions. I remember asking my friends on Facebook for help with the Youtility cover design, and being blown away by the smart feedback, especially from Billy Mitchell (whom I met through the extraordinary Mark Schaefer) who came up with the “why smart marketing is about help not hype” subtitle. I remember spending hours and hours and hours emailing individually to just about everyone I’d ever known, asking them to pre-order the book (a technique I learned from Gary Vaynerchuk). I was so incredibly touched and honored by the response. Just unbelievable. I remember getting the email that Youtility was a New York Times best-seller, and staring at the rankings on their website for many minutes. I remember being on vacation at the time, and trying to find a printed Sunday New York Times in tiny Show Low, Arizona being more difficult than I’d imagined. I remember subscribing to the Sunday New York Times shortly thereafter. I remember my old friend (from our email days) DJ Waldow recommending to me the digital marketing genius Zontee Hou. Zontee has been an extraordinary addition to the C&C team, working with corporate and agency clients. I remember all three of our annual Convince & Convert company retreats and thinking every time how lucky I am to have a team that I would do anything for, and a group that has had zero percent turnover, ever. I remember each of these circumstances, but more importantly these people, and what they’ve done for me (plus the many, many others that I didn’t include here, as this post could have been 15,000 words, easy). Chris Brogan did an amazing video years ago talking about it taking 10 years to become an overnight sensation. He’s right of course, but I remember it a little bit differently. I remember the hundreds of people who guided me, supported me, cajoled me, believed in me, helped me and gave me their time, attention, expertise, loyalty, friendship and love. I am equal parts fortunate and grateful. Each of them – and all of you who choose to read this blog or my tweets, or listen to my podcast or whatever – are trusting me to add value. That’s not my right. I haven’t “earned it.” I haven’t “paid my dues.” It’s a gift. And I try to never take it for granted. So when I’m asked why I’m so committed to the principle of being useful, and when I’m asked “how did you get to be the most retweeted person?” I’ll remember…to send them the link to this post.